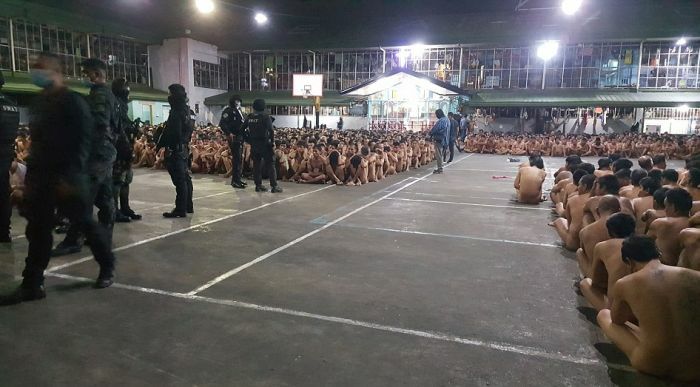 Photos showing hundreds of prisoners sitting naked in a jail in the Philippines have created an outrage on social media. The inmates were forced to sit naked on concrete while officers searched for contraband and the images are being compared to World War II concentration camps. Anyone knows a better way to make sure they're not concealing any weapon? Yeah, they should have individual 2 bedroom cells with TV, Internet, hot water, monthly allowance and multiple versions of menus. Because that's what civilized countries do: treat their criminals better than their working class. These dudes are not civilized though.